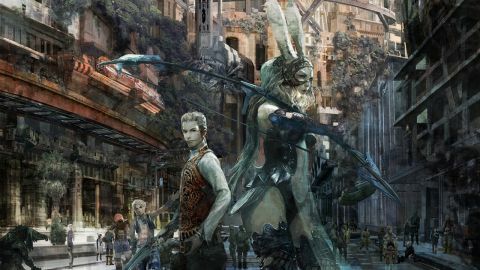 Final Fantasy 12: The Zodiac Age review: "The black sheep of the Final Fantasy franchise gets the second chance it deserves"
Everyone deserves a second chance, and there's no game more worthy of another go in the court of public opinion than Final Fantasy 12. The late PS2 game found itself caught between two audiences: one that embraced the wild departures in combat and storytelling, and the other that couldn't stand it. There's no entry in the series more polarizing than this one, and now here we are - 11 years later - with a high-definition update on PlayStation 4 subtitled The Zodiac Age. Luckily, time has been kind to Final Fantasy 12, and thanks to a series of enhancements this JRPG's originally unrealized potential can finally be unlocked. For those who aren't familiar, Final Fantasy 12 drops the series' tried-and-true turn-based combat for something much more closely resembling a single-player take on MMOs. Gone are the random battles that shift you into a separate combat screen every few steps; here, creatures wander the field, milling back and forth, sometimes getting into scuffles with rival animals. You and your retinue wander up to them and start smacking away in real-time - but rather than having to constantly pause combat to enter commands, you can program each of your characters with Gambits that allow them to react according to specific battle conditions. You can set up your characters to automatically heal party members when their HP falls below a certain threshold, shoot elemental spells against enemy weaknesses, or to respond with debuff spells if the enemy casts Protect on themselves, and so forth. Detractors say that this can lead to the game ‘playing itself’ but, really, all it does is reward players who fully understand their party's current loadout and enemy behavior with speedier, more efficient exploration. It was a surprisingly deep combat system back in 2006, and it's even better now, thanks to the Zodiac Age's biggest change: the inclusion of the Zodiac Job System. One of the biggest (and most legitimate) criticisms of the original game is that each one of Final Fantasy 12’s characters shared the same exact License grid - that is, a giant board filled with abilities and skills players unlock with Licence Points earned by killing monsters. This led to homogenous party builds, where characters became more or less identical killing machines by endgame. In the Zodiac Age, this single, massive board is replaced instead by a series of Job-specific grids originally made available in the previously Japan-exclusive International edition of the game. At the outset, characters can choose from one of 12 different boards, each one containing a handful of unique abilities. While a few of these skills are shared between boards, they're largely distinct and formed around very specific roles: the White Mage is your healer, the Monk is your tank who focuses on unarmed combat, the Time Battlemage can manipulate the flow of combat and comes outfitted with crossbows, and so on. This forces you to treat your party as more than just palette swaps, and you're afforded even more customization with the choice of a second job once you get about a third of the way through. Separate from the main game is the optional Trial Mode. Here, you can load your characters - complete with levels, gear, and abilities intact - and run through a gauntlet of increasingly challenging battles across 100 different levels. They start out relatively easy, but get hard fast, and it's here that your mastery of the combat system and Gambit optimization will be put to the test. It's worth checking in periodically as you level up so you can earn additional items and weapons - along with a few secret unlocks - to bring back with you into the main quest. Figuring out Gambits and optimizing builds before setting forth into the wilderness and slaying monsters is incredibly cozy, like curling up with a dense fantasy novel and allowing yourself the pleasure of spending time absorbing everything. The story almost seems built to accommodate this: rather than putting you under constant threat of narrative climax, the stakes slowly build as your band of plucky rebels and sky pirates seek out powerful magical shards known as 'nethicite' in order to turn the tide in the war against the invading Archadian Empire. It's a bit distant and subdued, as if it was written by someone who really likes solemn historical documentaries (which makes sense, considering the game was partially written by Final Fantasy Tactics scribe Yasumi Matsuno). As a result, its narrative feels far more mature than other entries in the series; less screaming teens and more political machinations and sweeping drama than you'd expect. The criticisms made against Final Fantasy 12's story are still valid - young protagonists Vaan and Penelo, while not as obnoxious as they could've been, feel like they have no impact on the story - but the lack of urgency allows you to really soak in the environments, explore beyond the bounds of the main story, and satisfy your wanderlust and desire for better loot and stronger abilities. Final Fantasy 12's atmosphere makes it all the easier to get wrapped up in its world. Make no mistake: this is most certainly a PlayStation 2 game brought forward into 2017, and its set of smaller interconnected zones hint at the grand open spaces which future FF sequels would take advantage of. Even so, Final Fantasy 12 succeeds largely thanks to a stunning art direction and sense of place, filled with distinct environments, fashion designs, and creatures that seem real enough to feel like a lived-in world (but just enough on the edge of fantasy to keep that creeping uncanny valley at bay). Locales like the desert kingdom of Rabanastre or the Mist-thick Feywood look better than ever, enhanced character models give our heroes an earthy, watercolor tone, and a re-recorded and rearranged soundtrack imbues a greater aura of wonder and adventure into the proceedings. Unfortunately, there are problems I had with Final Fantasy 12 back in the day that I wish Square Enix would've taken the time to address. For one, the world is filled with side quests, but you wouldn't know that by looking at it - the only additional quests Final Fantasy 12 tracks are its optional Hunts against more powerful monsters. For everything else, you simply have to remember that the person you talked to about a missing key is actually the beginning of a decently-sized quest chain. A log to keep track of different requests you come across would do wonders to keep you in-game and away from a strategy guide. There are also moments between story beats where you're all but forced to grind out a few additional levels to continue, especially near the final confrontation. A handy function lets you double (or even quadruple) the game speed to help mitigate these moments, but there's no getting around the times when you'll have to run back-and-forth to strengthen your characters or earn enough Gil to upgrade your kit. That said, there's no denying that Final Fantasy 12 is special; the kind of swashbuckling adventure with tactical combat that gives back as much as you put into it, and it's a testament to its foundations that it feels just as good to play now as it did over a decade ago. Thanks to the graphical enhancements and welcome gameplay tweaks offered by The Zodiac Age, the black sheep of the Final Fantasy franchise is finally getting the second chance it deserves.